Another fresh night of hip hop is hitting the Glass House in Pomona on Friday, Sept. 16. 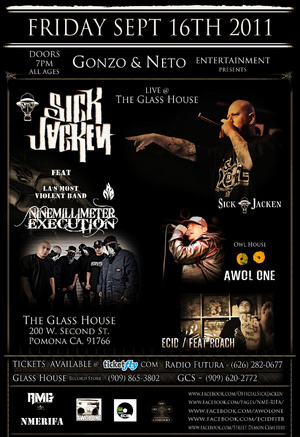 Featured acts include AWOL ONE, Sick Jacken, Ninemillimeter Execution and Ecid/Feat. Roach! Who knows what special guests will show up for some beats and flows. 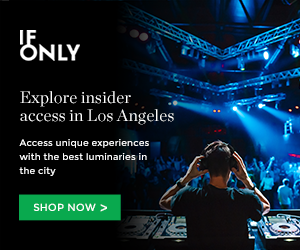 That’s always a fun aspect of L.A. hip hop shows, you never know who’s going to come through. Tickets to this all ages performance are $15-$20 and doors are at 7 p.m. Want to get yo’ rhymes on? Enter the contest below for a pair of tickets. Courtesy of our homies at the Glass House. You must have a Twitter or Facebook to enter the contest. First make sure you’re following Grimy Goods on Twitter here and/or “like” our Facebook page here. We’ll pick winners at random on Thursday, Sept. 15. The winners will be direct messaged on Twitter or contacted below their contest entry comment on the Grimy Goods Facebook page. Winners will have until noon Friday, Sept. 16 to claim their win or the tickets will be forfeited. To increase your chances, enter the contest both ways! Via Facebook: just leave a comment on the Grimy Goods Facebook page telling us who are you most excited to see at this show and why! Be sure to mention AWOL ONE with Sick Jacken so we know which contest you’re entering! This entry was posted in Giveaways and tagged AWOL ONE, concerts, contest, Ecid/Feat. Roach, free, giveaway, hip hop, indie, rap, Shows, Sick Jacken, sweepstakes, ticket giveaway on September 14, 2011 by Sandra Burciaga Olinger.